This is probably one of the best soups I’ve ever made. It’s simple to make but is filled with a ton of flavor. The broth is infused with ginger and thyme, which adds great warmth. By caramelizing the carrots you bring out the deep rich, sweet flavor of the carrots. This is a great soup to serve as an appetizer or as a light main dish. On a large baking sheet, toss carrots with olive oil and salt. Spread carrots out in a single layer. Turn oven to broil on high, place carrots about 6-8 inches below the broiler. Toss the carrots after about 5 minutes, once they’ve started to brown. While the carrots are roasting, sauté the onions in a large pot. Once the onions are tender, add the garlic and sauté for a few more minutes. Add the stock, ginger root and thyme and bring to a boil. Let simmer for about 10 minutes. Remove the ginger pieces and the thyme. Add the carrots and simmer for another 10 minutes, or until carrots are tender. 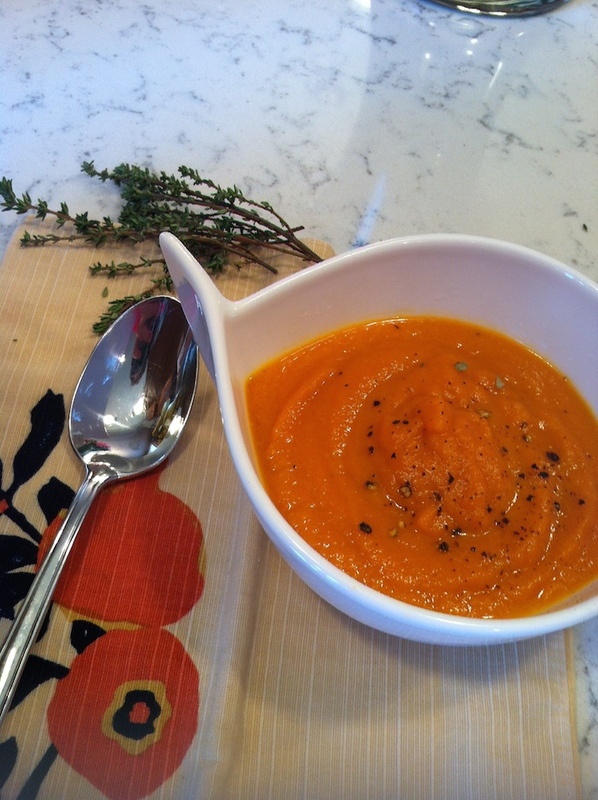 Using an immersion blender or a regular blender, puree the soup until completely smooth. Taste for seasoning and adjust if necessary. Serve with freshly ground black pepper.